Badgers are one of the most loved creatures we deal with. However they are very determined creatures and frequently cause trouble in residential areas damaging fencing, digging up bulbs, digging setts in inappropriate places as well as being found injured and causing road accidents. Most people see the occasional dead badger on the roadside but rarely see them live. There is an estimated population of 250,000 across the UK but the numbers are declining as more and more of our countryside is built on and DEFRA kill more and more badgers blaming them for TB! WRAS undertakes numerous badger rescue calls received via the Southdown Badger Group and Badger Trust Sussex. Badger call-outs received outside the areas covered by these groups should be passed on to the area badger groups for attendance. WRAS will only attend if the area badger group is too far away to respond or cannot be contacted. Badger road casualties can occur at any time of the year, but the most common times are during the spring and autumn when dusk falls during peak traffic times in the morning and evenings. Badgers are dangerous to handle and several members of the public have picked up unconscious badgers placed them on the passenger seat or boot of their car and driven off only to have to stop the car and get out and call for help when the badger comes to and starts charging round their car! If you find a road casualty park your car where it will help protect the badger from being hit again and turn on your hazard warning lights, however if it is dangerous to stop where the badger is move to a location where it is safer. Call for help as soon as possible. If the badger is in a dangerous location and could cause an accident then call the police using 999 and ask for assistance. If the badger is alert or moving watch it but do not try to catch or hold it, stand well back. If the badger tries to move towards the road and traffic then try to discourage it by standing between the badger and the traffic, but again only do so if it is safe to do so and you are not putting yourself at risk. If the badger is lying on the road and not holding its head up, then cover the animal using a towel or blanket, again keep your distance once the badger is covered and wait for help to arrive. Badgers caught in snares should not be cut free and just released. Call for help as soon as possible. Such calls will be treated as emergency calls. Snares cause ligature wounds and once freed from a snare the toxins which build up below the sometime invisible ligature wounds can cause the badger to have a heart attack. These creatures must come in for observation and care for at least 24 hours to ensure the animal is safe and well. Snares around legs can be extremely dangerous as the pressure can cause the top layers of skin to die off and in the worse case scenario they can loose the limb completely. Call for help as soon as possible. Try to cover the animal over with a blanket or large towel but do not get too close or stand close enough for the animal to bite you. It is more important to try and cover the head than the body but try to cover as much of the body as you can. Once the head is covered the animal will calm down a bit. Do not stand too close to the animal and keep noise down or you will frighten the poor creature. Dead badgers should be reported to the local area badger group for their records - see their numbers above. 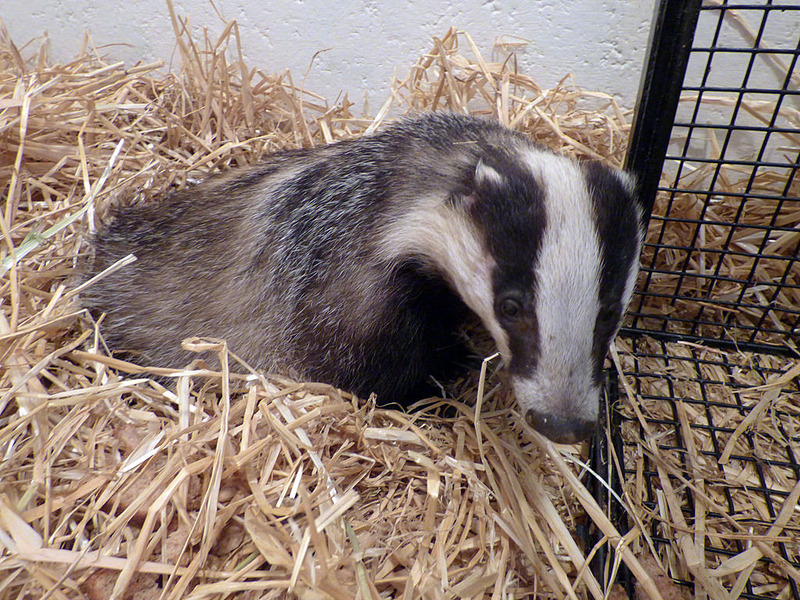 East Sussex WRAS does not remove dead badgers, except where an illegal death is suspected. It is the responsibility of the land/property owner to dispose of a dead badger if found on their property, however your local council or veterinary centre may be willing to assist with the disposal. If you find a dead badger on the road it should be reported to your district, borough or city council for disposal as they have an obligation under European law to dispose of dead animals on the road. WRAS does not support the regular feeding of badgers in gardens, due to the problems they can cause as a result. Like all animals, badgers will breed to match a food sourse. The occasional bit of food left out for them is not a problem but feeding large quantities can cause problems. One garden WRAS visited a lady was putting out three washing up bowls of food per night for the badgers. In three years the badgers visiting her garden had changed from 2 at a time to 12 at a time. Surprisingly the neighbours were not happy at the damage which was being caused by attracting the badgers to this garden. As a result over one thousand pounds worth of repairs and work had to be carried out to neighbouring gardens to stop the badgers from causing damage in their neighbouring gardens. If you want to put out scraps occasionally this will not be a problem but limit the amount of food and the frequency in which it is fed. It is better to plant fruit trees and bushes and even crops like maize which badgers like in a small area of your garden. The use of natural food means that if the person feeding goes into hospital or dies or moves away the food source may well stay and help the badgers long term, avoiding any possibility of dependant badger starving as a result. We receive several complaints about badgers digging up bulbs and digging latrines in gardens. Badgers have regular pathways which they use like clockwork most nights. Trying to stop them from using their pathways is extremely difficult and can result in more damage than you bargained for. By blocking up a hole under a fence you may find they break down your wooden fence to get though. Badgers adapt very well to development and can survive quite well in the middle of a building site, but end up causing a lot of damage to surrounding gardens once the development is finished. This is a sad fact of our encroachment on our countryside. The main problems which residents encounter are badgers digging up their garden for several reasons. Badgers love beetles and leatherjackets and with a very sensitive sense of smell they can easily locate them just under the surface of your lawn. The use of bone meal and fish meal to feed plants can be an attraction for badgers too. Badgers will also dig holes to defecate in. There are several products which can be used to discourage badger from using your garden and lawn. Most garden centre will stock a range of badger and fox deterrence products.